Joseph Addison, the English essayist and Whig politician, once remarked that he valued his garden more for being full of Blackbirds than of cherries and 'very frankly gave them [the Blackbirds] fruit for their songs. These sentiments find resonance in many of us; a nation of gardeners gleaning enjoyment from most, though not necessarily all, of the wildlife that a garden supports. The extent to which an individual sets out to manage their garden for birds and other wildlife is debatable; it is clear that a garden serves many purposes and its value to birds or other wildlife is often a secondary consequence of management targeted towards other goals. A garden that is good for wildlife is likely to be a stable ecosystem in its own right, integrated with the landscape around it and providing a diversity of micro-habitats within its boundaries. Such stability has advantages for you, the gardener, as well. A stable, diverse system is unlikely to be over-dominated by any one species or group of organisms. In practical terms this means that you should have fewer problems with pest or weed species and be less prone to outbreaks of disease among the plants that you grown. Which species use your garden will, in part, be determined by where your garden is located and which habitats surround it. Consider the nature of the landscape before you set about adding features to your garden. You may not be able to provide a feature that a particular species needs in order to breed but you may be able to add a feature that supports the species if it happens to be breeding nearby. For example, the Gatekeeper butterfly does not usually breed in gardens because it needs rank grasses for egg-laying. While such micro-habitats are still to be found in farmland, often alongside hedgerows, nectar sources important to the adults may be missing. You can help by providing plants like Wild Marjoram Origanum vulgare, Common Fleabane Pulicaria vulgare or bramble Rubus fruticosus agg. As gardeners, we are in the privileged position of being able to create an artificially high number of micro-habitats within a small area. A Blackbird, for example, may nest and shelter in your shrubs, feed on worms taken from your lawn or bathe in your pond. Such features are surrogates for the naturally-occurring micro-haboitats found within the woodland shrub layer and woodland glades. 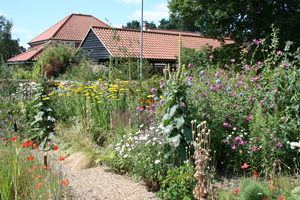 The communities of plants in our gardens are likely to be rather different from those established in other habitats. A typical garden flora will almost certainly be composed of a mixture of native and non-native (alien) species, selected for a range of reasons not necessarily linked to their wildlife benefit. There has been a significant amount written about the benefits of using native species in preference to alien ones. However, in contrast to the plethora of advice derived from the notion that native plants are good and introduced ones are bad, there has been very little scientific research into this particular question. While there has been little direct comparison of native and alien species and their use by insects and other organisms, it would be wrong to say that alien plants as a whole have little or no wildlife value. Some will be of value, some will not be of value and some will be invasive and should be avoided altogether. There is an ever-increasing array of plant varieties on sale at garden centres and specialist nurseries these days, with new colour forms and structurally divergent cultivars of familiar plants for use in our gardens. Such cultivars may be very variable in their wildlife value when compared with ancestral forms. For example, the double-flowered cultivars of certain species have become popular because of their novel appearance and longer flowering season. However, these double-cultivares have been shown to produce less seed and their unusual structure may also decrease their value to nectar feeding species of insect. Within this section of the website you will find advice on different elements of wildlife gardening, much of it drawn from Gardening for BirdWatchers. Use the menu on the left to access the different topics we have covered.